Festive holidays are always made better with awesome company and great food! The recent Christmas Eve, I had a smashing whimsical time at SOULed Out at their newly renovated quarters in Sri Hartamas. If there is a group who knows how to throw awesome parties, I can tell you it’s definitely the fun elves from SOULed OUT group. These elves just know how to have a great time and are always creative when it comes to all the functions they carry out at all their outlets whether it’s SOULed Out, WIP, Tujo and Hubba Hubba. 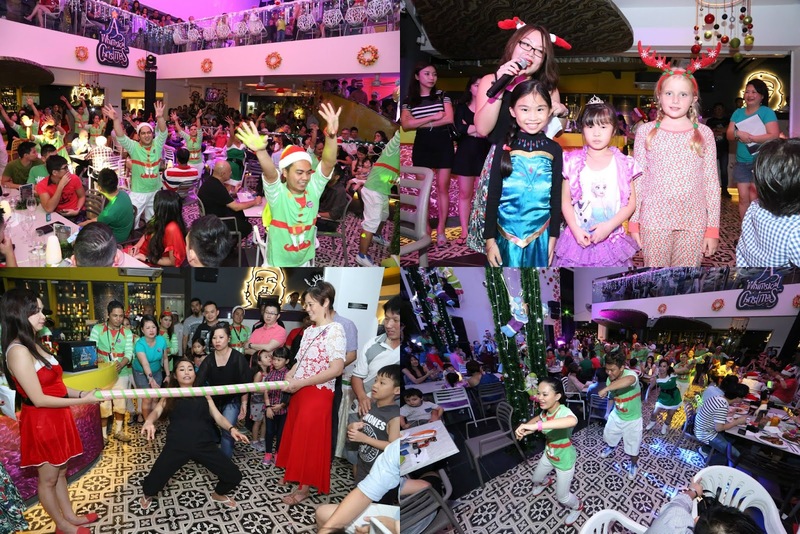 We round up some foodies and met up at SOULed OUT at Sri Hartamas on Christmas Eve and celebrated Christmas countdown with a big bang. The newly renovated SOULed Out is now modern and contemporary with a fun chic element. This is one restaurant that I don’t mind enjoying their alfresco area as there are plenty of fans to keep the ambience cool and windy. It is also spacious with two levels of dining space. The ceiling of artistically decorated petal motifs and the whole ambience is gorgeously lighted with flirty neon lights. Lots of white fills the ambience through walls and furniture, allowing pops of colors through other decorative elements and lightings. The party kicked off early in the evening and many diners were already seen filling up tables while there were also many waiting in line for tables as well. There was a live band, Colin & Friends crooning out Christmas songs as well as other music. The whole place was decorated with lots of holiday merriments. It was certainly a great place to ring the joyous Christmas with all the efforts put in by the SOULed Out team. 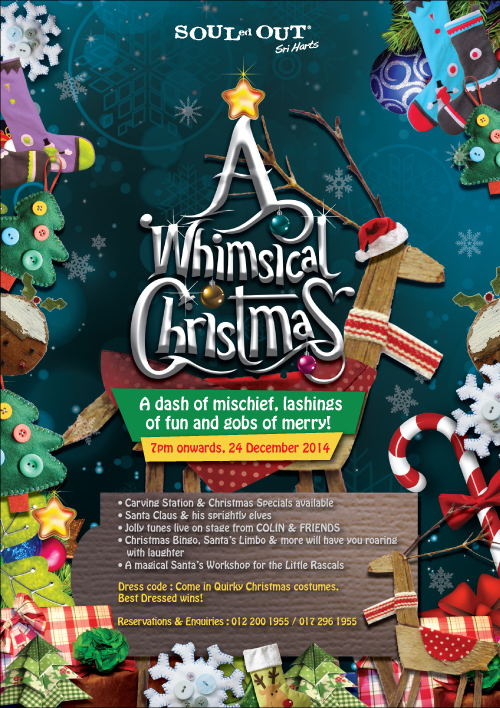 This year’s theme, A Whimsical Christmas was perfect for SOULed Out. Every element was injected with lots of whimsical notes and quirky elements. In theme with the holidays, SOULed Out chefs has also whipped up a festive menu for Christmas Eve. The menu is filled with sharing appetizer platter to mains, dessert and drinks. There is even a Carving station of Roasted Turkey with the full trimmings. Of course it won’t be a party with some giggle juices and SOULed Out is famous for their cocktails, especially mojitos. My giggle juices of the evening were Lychee Mojito and Pina Colada while the partner has Dragonfly and Guinness. Little one had his usual favorite Fresh Apple Juice. The Lychee Mojito was resfreshing and bursting with rum, lychee, lime and mint. Polishing off that tall glass was easy and utterly satisfying! The Pina Colada was good too with its hit of strong rum, creamy coconut and tangy pineapple. Our appetizers for the night took off with a big round of Nachos, Calamari, Crispy Shrimp, Chicken & Beef Satay and Summertime Salad. This round alone is already a bountiful feast! Crispy corn Nachos piled beneath a blanket of melted cheese, salsa, jalapeno, lettuce and sour cream is the perfect snack anytime for me. SOULed Out Satay is delectable as these skewers are plump chunks of meat beautifully seasoned with lots of spices and nicely grilled. The tender juicy meat has just the right balance of savory with sweetness. Dip these into thick chunky peanut sauce for extra yumminess! For golden fried appetizers, the crispy Calamari and Crispy Shrimp are the perfect snack for beers or cocktails. What’s not to like when the Calamari is crispy outside and tender inside served with tangy spicy chili sauce or glorious golden Crispy Prawns served with two sauces? The prawns was quite large and was really so yummy that I believed that I had three of these crustaceans. Hailing from the Carving station, we also got to try the Roasted Turkey with stuffing, gravy and cranberry sauce with some roasted potatoes. It’s a good roast as it has enough moistness in the meat and the gravy and stuffing balanced everything nicely. 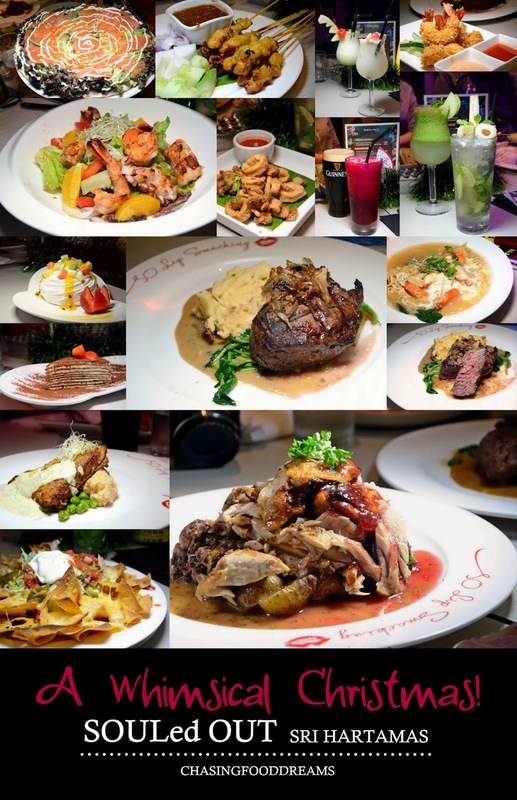 Mains from the Christmas menu were Kris Kringle Beef Tenderloin, Yuletide Seabass and Smoked Herbed Crusted Premium Roast Beef. I had the Kris Kringle Beef Tenderloin while my other half had the Yuletide Seabass. The Kris Kringle Beef Tenderloin has a large piece of premium Australian beef tenderloin nicely chargrilled to medium. The tenderloin is served with sun dried tomato mashed potato, sautéed watercress and mushrooms in a white wine jus. There were also some caramelized onions crowning the beef. The overall combination worked out deliciously. The beef was very tender and juicy with a good dose of smokiness and the sweet onion added more bonus flavours. The sides worked really well with the beef so to me, this dish was really satisfying. The dish that rocked my boat that evening had to be the Yuletide Seabass. One taste of the baked seabass with a magnificent parmesan crust and I am totally sold on the dish. I loved the new take on the fish & chip idea. Serving the fish with sundried tomato mashed potato, fava beans with sage and caper sauce really elevated the whole dish to a new level. I kept stealing bites from my other half’s plate. If you do see this in their specials or regular menu, make sure to order this! Off the Christmas menu, we also tried Sake San Pizza and Sang Har Mein. Sake San Pizza is a signature at SOULed Out. Its pizza topped with smoked salmon, fish roes, greens, tomatoes, mozzarella and mayonnaise with a wasabi note. The pizza has a fresh flavour note from all the fresh greens and salmon. Their Sang Har Mein has crispy wantan mee topped with fresh water prawn and thick egg gravy. This is also a signature dish that is loved by many at the restaurant. My little one had their Baked Macaroni & Cheese… creamy with lots of ham and cheesy flavours. Desserts were Tiramisu Crepe and Tropical Pavlova. Both desserts are very different from each other. The Tiramisu Crepe is chocolaty and yet light enough to be enjoyed. It also has a good strong note of coffee. The Tropical Pavlova is crispy and chewy meringue topped with various tropical fruits and coconut cream. Though the pavlova is really sweet, I still enjoyed it as the textures are very interesting while the coconut cream is delish. As the evening moved on, there was a Best Dressed competition for kids and ladies. It was without a doubt on who were the winners as the crowd gets to decide by their loudest cheer for the winners. We also played Christmas Bingo and there was also a Limbo Rock competition. Then we had Santa’s SOULed Out elves perform some dance entertainment for us too. Just few minutes before the countdown, we moved to their opposite lot where we were surprised with Santa high up in the air waving to all of us, a balloon drop and a candlelight ceremony. My little one squealed in delight as this was the first time he finally have an interest in Santa and he also got to meet him plus the balloon drop was the cake topper for him. SOULed Out Christmas Tree held precious ornaments representing precious moments made through time in the SOULed Out journey. Indeed my Christmas Eve was truly memorable. Great company of friends, cool and fun ambience, scrumptious food and cocktails plus lots of entertainment makes the festive season a precious memory. The next time you think of parties, you should definitely head over to SOULed Out, Tujo, WIP and Hubba Hubba for a smashing good time! This planning team and event coordinator is creative, organized, reliable, and such a pleasure to work with. We have become such special friends and I am sad our planning is over because I have enjoyed working with them so much.